You saw the sneak peek photo yesterday…..now here’s the full scoop on my recent piano purchase! I’ve been shopping on Craigslist for quite some time, and I learned that a lot of piano shopping is about personal preference. My husband and I looked at an absolutely breathtaking Knabe from the 1920’s, for example, but as soon as I played a few notes I knew it wasn’t the piano for me. Somehow, it just didn’t grab me. I wanted to find something that I would love to sit down and play. Then, we looked at a 5’7” Kawai….. The owner was asking $3500. It was built in 1966, and the inside parts and the finish are all in original condition. I could see it probably needed a little bit of work, but I really, really liked the touch. It was fun to play! I hired a registered piano technician to inspect the piano for me before I bought it. The technician confirmed that it does need some work, but we were able to talk the owner down to $2500. 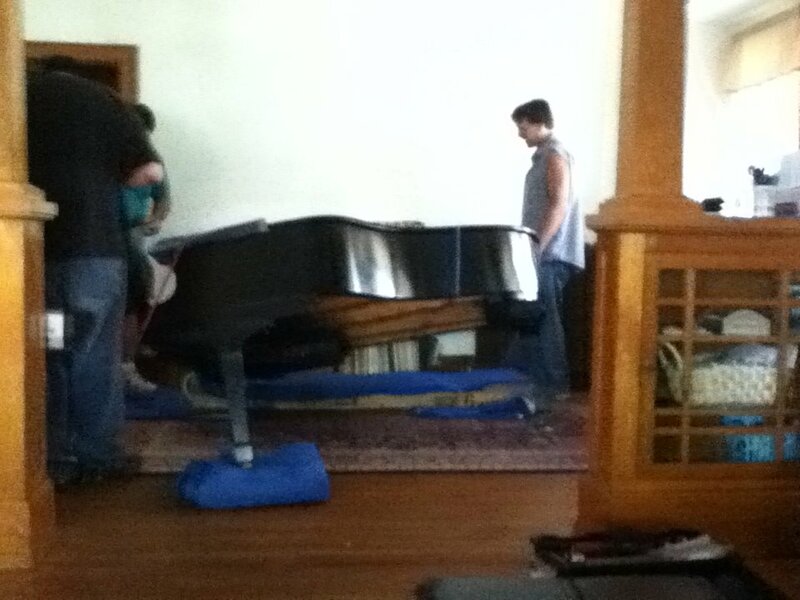 My new piano was delivered last Friday! Sorry the photos are a bit grainy…I used the camera in my iPod Touch. And here I am enjoying my new piano! Part of me still can’t believe I’m now a piano owner. How cool is that?! You got a great piano for an even greater price! Congratulations! Joy, Congrats in the purchase. I’m a piano technician in the Toronto area, and while they’re somewhat rare, those 1960’s Kawai’s were very well built and can be very sweet sounding. Enjoy! Thanks for the comment, Paul – what you say confirms what the piano movers said! They commented on the piano’s weight and the quality of its build. I do like the touch and tone very much, so I’m definitely very pleased with my purchase! Yes, Kawais can be very lovely pianos. Congrats on the new piano!! I teach on a Kawai studio and it is a gorgeous piano. It makes you want to play it. Many of my students have immediately noticed the difference upon sitting down to play this Kawai. Congrats. Let us know what kind of work you get done. Hi Joy, I have been so inspired by your life and your work .I would like to communicate with you by email. Can I have your email address please? I love Kawai piano! I have a Kawai K3 and am really enjoying the beautiful soft tone of the piano! I bet yours sound beautiful, too! Wow, what a great price! (Sorry for spamming you with comments lately, I’m just having fun exploring your site!) Pianos are REALLY expensive here. My brand-new Irmler grand cost almost $11,000. Luckily it was a wedding present!